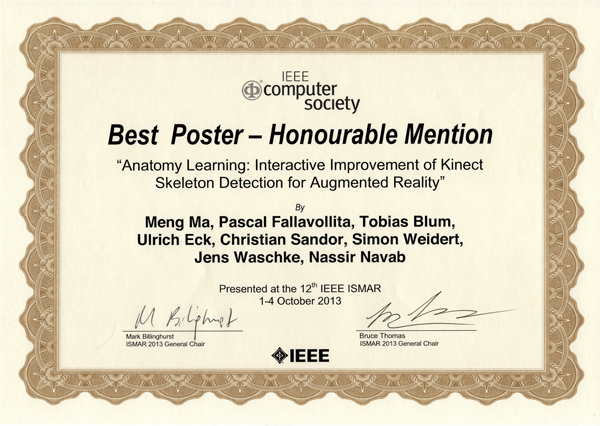 We won the Best Poster Runner Up Award at the IEEE International Symposium on Mixed and Augmented Reality (ISMAR) for the submission "Kinect for Interactive AR Anatomy Learning" as collaborators with the NARVIS lab from the Chair of Computer Aided Medical Procedures at Technical University of Munich. 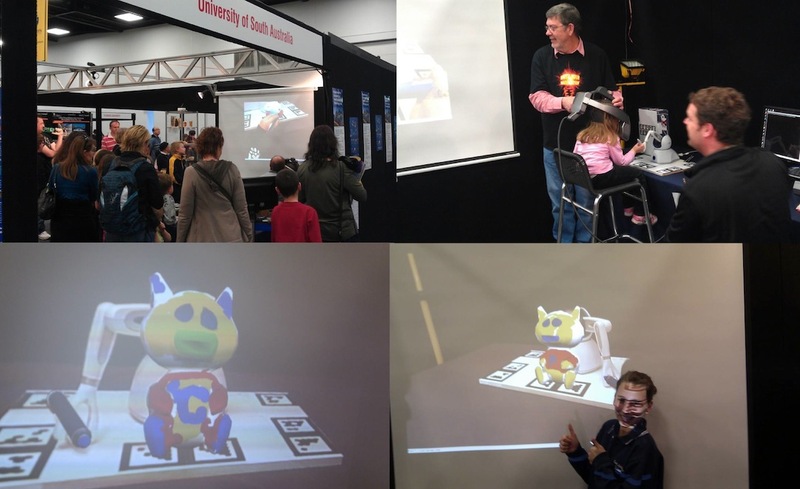 ISMAR is the premier conference in its field and took place in Adelaide, Australia. Education of anatomy is a challenging but crucial element in educating medical professionals, but also for general education of pupils. Our research group has previously developed a prototype of an Augmented Reality (AR) magic mirror which allows intuitive visualization of realistic anatomical information on the user. However, the current overlay is imprecise as the magic mirror depends on the skeleton output from Kinect. These imprecisions affect the quality of education and learning. Hence, together with clinicians we have defined bone landmarks which users can touch easily on their body while standing in front of the sensor. We demonstrate that these landmarks allow the proper deformation of medical data within the magic mirror and onto the human body, resulting in a more precise augmentation. 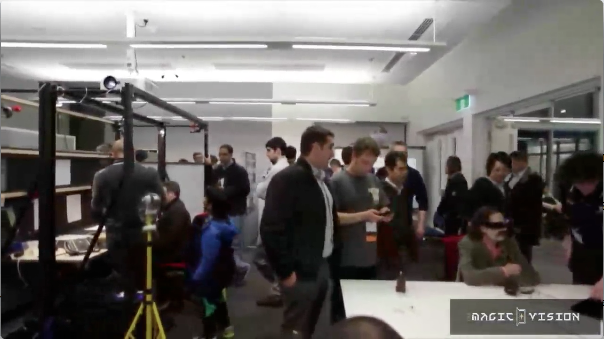 During the IEEE International Symposium for Mixed and Augmented Reality (ISMAR) 2013 in Adelaide we presented our research at the Mawson Lakes Open House. This video shows the highlights of this event. Magic Vision Lab Students visit Tohoku University, Japan. Two students from Magic Vision Lab, Graeme Jarvis and Kenny William Nyallau, together with Dr. Christian Sandor are currently visiting Professor Kitamura's Interactive Content Design Lab at Tohoku University in Sendai, Japan. Tohoku University is one of Japan's most prestigious universities. Professor Kitamura is a world renowned leader in his field of research, Human-Computer Interaction, and he is also a talented amateur photographer. 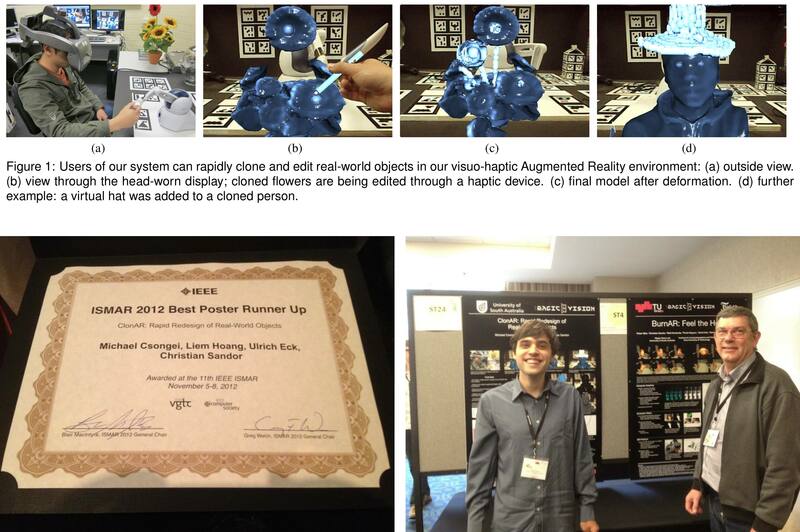 We won the Best Poster Runner Up Award at the IEEE International Symposium on Mixed and Augmented Reality (ISMAR) for our submission "ClonAR: Rapid Redesign of Real-World Objects". ISMAR is the premier conference in its field and took place in Atlanta, USA. ClonAR enables users to rapidly clone and edit real-world objects. First, real-world objects can be scanned using KinectFusion. Second, users can edit the scanned objects in our visuo-haptic Augmented Reality environment. Finally, users can print the edited models using a 3D printer. We were also nominated for Best Paper Award for our submission "Tablet versus Phone: Depth Perception in Handheld Augmented Reality". In this paper, we present an array of experiments that compares user performance with an iPad 3 and with an iPhone 4S. Due to the recent uptake of handheld Augmented Reality applications, a topic of great practical relevance. Winner in 2012 Samsung's Global Research Outreach Program! Samsung's Global Research Outreach program, open to leading universities around the world, is Samsung's annual call for research proposals. 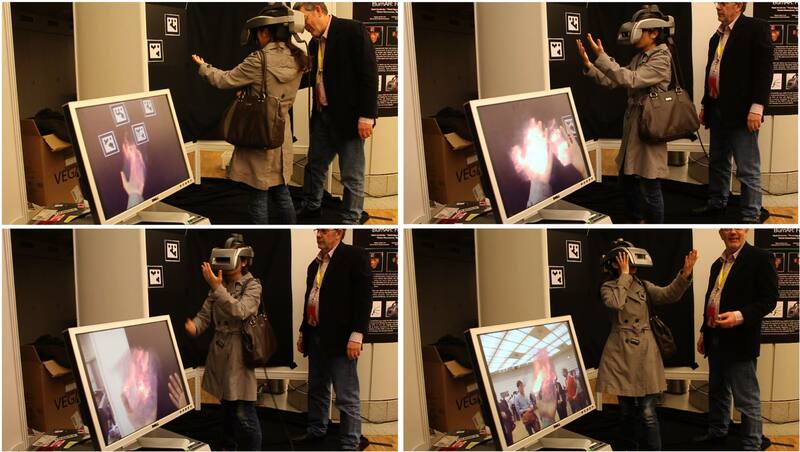 Magic Vision Lab was among the 2012 winners for our proposal "Next Generation Mobile User Interfaces with Augmented Reality Visualizations" (together with Jun Park, Hongik University). We will receive significant sponsoring from Samsung for one year, with a possible extension of two more years. Other winners include labs from MIT, Stanford University, UC Berkeley, Carnegie Mellon University, University of Oxford, and King's College London. 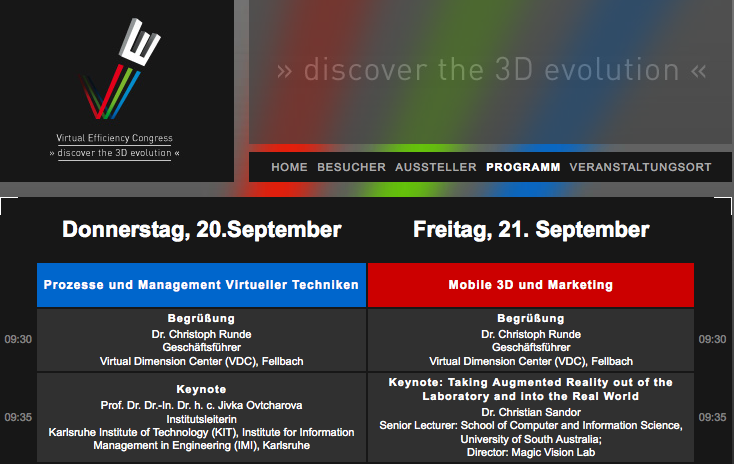 Our director, Dr Christian Sandor, is invited as keynote speaker to the Fourth Virtual Efficiency Congress in Fellbach, Germany on 21 September 2012; this congress is the biggest German industrial VR congress. 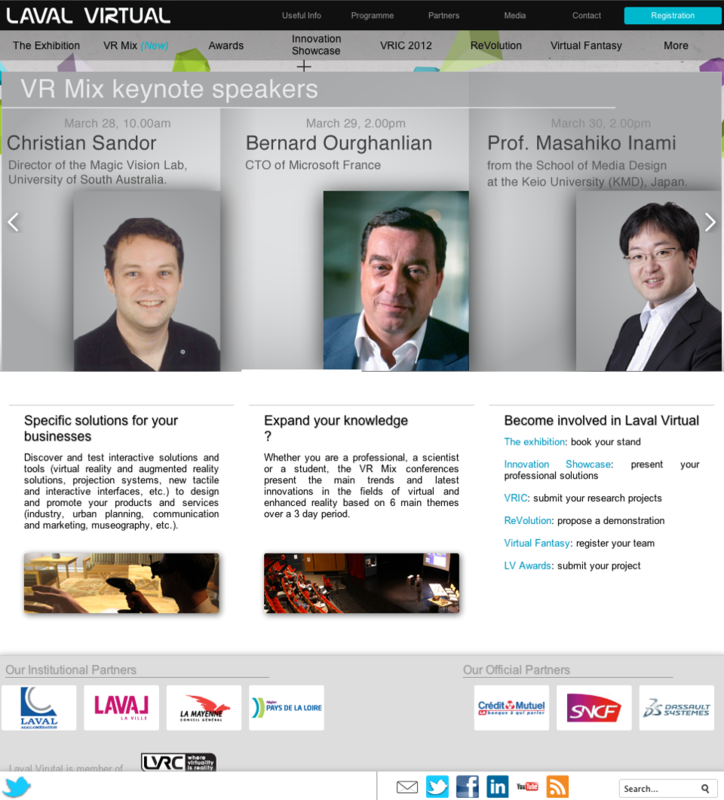 Our director, Dr Christian Sandor, presented a keynote talk at the well-known 14th Virtual Reality International Conference Laval on 28th March 2012. You can watch the keynote talk on YouTube. Co-Chair and Program Committee Member of the session: "The Futures of Mixed & Augmented Reality"
Fairlight, TU Graz, and Magic Vision Lab have collaborated on a demonstration "BurnAR: Feel the Heat", which won Best Demo Award at IEEE ISMAR 2011. ISMAR 2011 (IEEE International Symposium on Mixed and Augmented Reality) is the premier conference in its field and took place in Basel, Switzerland. In this demo, a user experiences their own hands interacting with complex graphics simulating smoke and fire effects in the environment. A user looks through a stereo head-worn display (HWD) at their own hands, which start to smoke and interact with flames. A real-time fluid simulation calculates the volumetric effects using the user's hand as input for motion and interaction surface. The hand's location and depth is estimated from the stereo view delivered by the HWD's camera pair. Ulrich Eck , an undergraduate student, has been awarded with a School of Computer and Information Science Undergraduate Honours Scholarships (AUD 3000 per annum) for his academic merit. Ulrich will now continue his Honours Thesis on Haptic Augmented Reality. Arindam Dey has been awarded with a School of Computer and Information Science Research Award for his excellence as a PhD student. Arindam is currently finalizing his PhD studies on the Evaluation of Mobile Augmented Reality Visualizations. Magic Vision Lab takes the opportunity to congratulate the award winners and their supervisor Dr Christian Sandor , and encourage them to produce more high quality research in the future. See more press coverage in our Media Section. We have got a short paper accepted at the international conference of IEEE Virtual Reality 2010 and a conditionally accepted poster at IEEE 3D User Interfaces 2010. We will present our work on mixed reality visualizations and evaluation of user experiences which will show our latest research in mobile augmented reality and we are looking forward to exchange our thoughts with you. Please join us in the beautiful city of Waltham, Massachusetts, USA during 20-26 March 2010. Two more articles from the press have been added to the page: 1) "The Future of Augmented Reality" published in the Calcalist. 2) Gamesalfresco has reported about our web page. We are going to present a third paper at IEEE VR (Waltham, MA, USA): Besides our poster (3DUI) and short paper (IEEE VR), we recently got a paper accepted for the SEARIS workshop. As the final task of 2009, we have completed this webpage. Please enjoy!